TopBetta is an Australian sports betting site which launched in 2010 and is not only known for offering an array of the usual betting markets such as racing, AFL, NRL and Cricket, but also offering sports and racing betting ‘tournaments’. Like any of the best Aussie wagering sites, TopBetta's bread and butter is offering great prices on a range of different markets, however, TopBetta is also great new site for punters looking for something a little different, so we suggest everyone give TopBetta Tournaments a try. Read our full TopBetta review for more details regarding what TopBetta has to offer! When you first arrive at TopBetta.com.au you will be prompted with a login screen which allows you to easily navigate to the three main sections of the site – Racing, Sports and Tournaments. If you're not interested in tournaments, TopBetta works as a perfect stand alone wagering site, and from the racing and sports tabs you can easily access all the great markets and odds they have on offer. While their main project as a new company was to inroduce tournament betting to Australia, TopBetta have drastically improved their standard betting markets in recent times, putting them on par with the biggest bookmakers in Australia. They have also displayed innovation with the announcement of their "GOAT SP" product which provides the "Greatest Of All Totes" to give punters the best bang for their buck. Put simply, GOAT SP combines the Official Starting Price (or TopBetta fixed SP, should an official SP be unavailable) and the final best tote dividend, and pays customers at whichever is greater. 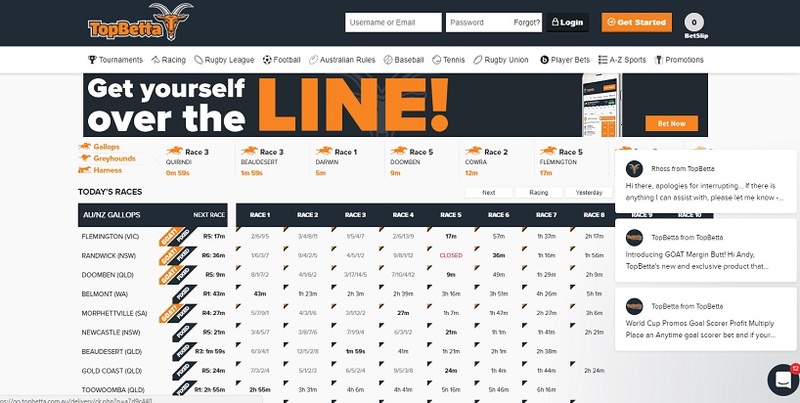 TopBetta ensures it easy to place a bet on the races, with the column on the left allowing bettors to toggle through gallops, dogs and trots and then choose the racing meeting before the form guide and odds of each race are shown. Odds and prices are very competitive with the ‘GOAT SP’ product providing punters with the best odds available. There are some max win limits at TopBetta so if you plan on betting massive amounts, be sure to check out the full terms and conditions at the site. As we mentioned above, TopBetta have been working hard to improve the amount of markets on offer to punters. In an aim to get their tournament feature up and running, it was thin pickings for some of their sports markets, particularly the American sports. However, that has now changed and TopBetta now offer hundreds of markets on NBA, NFL, and Ice Hockey as well as the more popular Australian and international sports. Navigating the sports side is just as easy, with a drop down 'A/Z Sports' tab at the top or your page where you can select from an array of sports. The one aspect that TopBetta offer that no other bookmaker in Australia does is the phenomenon of tournament betting. The concept is quite simple and anyone who is familiar with how poker tournaments work will be right at home. TopBetta also offer a regularly updated blog for punters to peruse, reporting on news from the betting world, providing tips and displaying opinion pieces. Basically, there is a tournament that as an example may be Round 3 of the AFL season. There is then an entry fee that punters pay – say $20 – which goes into a prize pool. Each punter is then given a fantasy bankroll to bet on any games they wish for Round 3 of the AFL. The punter who makes the most fantasy profit from their start bank wins the tournament and is awarded the money from the prize pool or at least the largest portion of it depending on how many people enter the tournament. There are tournaments on offer for all kinds of events such as Cricket, the A League, NRL and AFL and there are regular racing tournaments running every day that pit punters against each other for certain race meets. In recent times, TopBetta have offered some huge prizepools for their tournaments. There are weekly $5,000 tournaments for both NRL and AFL for just a $10 buy-in. They have also held multiple $250,000 prizepools for major horse racing carnivals with a $100,00 guaranteed top prize. Rumours are that a $1 million prize pool tournament will be held later in the year. Even better is that TopBetta offer heaps of ‘freeroll’ tournaments which cost nothing to enter and feature prize pools donated by TopBetta, so it's a great way to test out the TopBetta software and give sports betting tournaments a try at TopBetta! Information in above video correct at time of recording. TopBetta also offer a fantastic 100% first deposit bonus offers for new customers! Simply deposit up to $100 into your TopBetta account and you will receive a bonus matched to your deposit up to $100! That's 100% bonus! Simply click the banner below for more details. Note: Currently, TopBetta bonuses may only be used on racing markets. No bonus bets on sporting markets will be accepted. Bonus bet offers exclude some states and turnover requirements apply for bonus bets. Make sure to check out the full terms and conditions on TopBetta before signing up to read up on how it all works a little more extensively. Once you have done that, just sign-up to TopBetta and start playing in their fun free-to-enter and buy-in betting tournaments or using them as a great Australian betting site with great racing odds thanks to their GOAT SP product.